Corundum (an alumina is an oxide of aluminium of Al2O3) with the admixtures of titan and iron ferrous. Chemically clean Corundum is transparent and colourless. Corundum, occupying on hardness the second place and yielding in that behalf only to the diamond, is widely known under the names of Sapphire (all of colourless and coloured stone, except for crimson) and ruby (darkly red, painted an element by a chrome) and retains leading position among the coloured jewels (semiprecious stone). It is widespread stone, especially in rings. 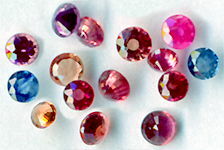 Light red and darkly-rose stone are named rose Sapphires, therefore between them and rubies is a gradual imperceptible transition, but it is impossible simply sharply to differentiate these varieties. Colourless achroos and transparent Sapphires name Leukosapphires, last on norms does not fall into the category of stone, on trade which are require a license. Sapphire - one of the most perfect and dense structures of minerals. Although lattice of filling of space in the crystal of corundum and diamond differ, but the structures of both minerals are dense, symmetrical, both minerals are Mohs hardness (diamond - 10, Corundum - 9) as a result, colourless and sparkle brightly. 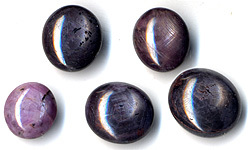 Clean Corundum, consisting only of aluminium and oxygen, is colourless absolutely (Leukosapphire). It looks like a diamond. Unhardness to entangle them. The border of Leukosapphires quite often is surround more dear and showy stone in burmese and Siamese wares. Leukosapphire flash strongly, but does not "play". But a "game" of diamond is the showiest property: it crushes white light on the brightest spectral-clean sparks, take wing and by a fan scatterings round the cut core. Therefore at Sapphires most value a color and quality of colouring of stone. That the dark blue color of Sapphire is conditioned being in him of titan, is set at the synthesis of Sapphires with the use of this element as painting material. The ordinary yellow colouring of Sapphire is related to the presence of oxide of iron ferrous. Often there are multicoloured stone. Heating usually results in lighting up of Sapphire. inconspicuous-purple, violet and yellow stone lose colouring in this case, and intense-purple, violet stone acquire pink, rose color. A x-ray radiography (Roentgen) irradiation does colouring more deep and intensive, painted there can be even colourless stone. Starred asterisk Sapphire has inclusion rutile which forms three- or the Hexacorallia star, therefore they are cut cabochon. Rose, yellow, orange and green Corundums Sapphires name also. Opaque Corundums of dark blue, grey-blue and grey-yellow color meet in nature much more frequent, accordingly and crystals similar unstandard Sapphire both in mountain rocks and in collections of minerals it is possible to see much more frequent, than the cut stone. They very much characters and memorized well. Corundums appear and in those areas of rocks, where a granit magma is inculcated in crystalline limestones; such beds name skarns. Sapphire has an unevenness of colouring, reducing the price of jeweller stone. At price of Sapphires comparable with diamonds. To XIX century Sapphires named all of dark blue stone, including lazurite, lapis lazuli. Presently after the noble varieties of corundum the name Sapphires gained a foothold also, only coloured. The most valuable are consider blue-dark blue (Kashmir, burmese and cingalese) Sapphires. Sapphires with a greenish tint (Australian, Kenya) valued below. There are in the special demand the rarest starred asterisk natural blue Sapphires (they have a synthetic analogue). Ennoblement of corundums for the improvement of color, to transparency et cetera made by heat treatment, irradiation or diffusion. Very hardness to distinguish the ennobled stone from stone with the natural colouring. At treatment Sapphire apply the step, diamond or combined cutting (diamond above, step down). 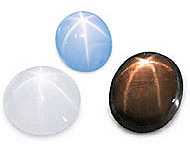 Less transparent stone, and also stone with asterism or effect of cat's-eye of cabochon. 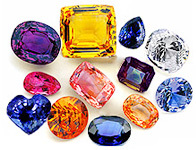 Coloured Sapphires can be entangled with other minerals and synthetic materials of analogical color. Diagnostics them made on physical properties and including. Among the stone of Sri Lanka (Ceylon, Indian Ocean) a considerable stake is made by milky-blue cyan sky Sapphires. The deposit of Yogo-galch behaves to the magmatic type (state is Montana, USA). The shallow (no more than 2 punishments) lamellar crystals of Sapphire of this deposit have from inconspicuous- to blue-dark blue or violet colouring. To basalts the deposits of ruby and Sapphire of Australia are related (the states are Queensland and New Sonth Wales). The crystals of Sapphires in form the truncated pyramids with the badly expressed verges have different colors: there are green, orange-yellow gold, yellow sometimes with asterism, and also stone with an alexandrite effect; the stone of navy differ sharply expressed dichroism in dark blue-green tones. The deposits of Sapphire are present also in Thailand (Siam) and Kampuchea. To pegmatites the deposits of Sapphire Mogokskiy are related mining district of Burma. The Indian deposits are in state Jammu and Kashmir (Indian control) have pneumatolysis-hydrothermal genesis (in plagioclases, in marbles). The large crystals of Sapphire differ dark blue, by a violet, green and yellow color. Length of the zonally painted crystals to 12,5 sm, width to 7,5 sm. This stone-talisman amulet phylactery obeah strengthens informal lordship of people over other people, strengthens a spirit and is the stone of teachers high level. Starred asterisk Sapphire is a talisman of faith, hope and love, giving a people wisdom in achievement of the set purpose. Sapphire is a daryl loyalty, chastity, attracts friends, gives a modesty and veracity, drives away enemies - and visible, and invisible. All of jewels of level of Sapphire (diamonds, beryls) are dangerous the defects - cracks, spots, turbid areas. And it is necessary to remember that stone of good water, transparent, without vices maximum rarely meet in shops. As an amulet and Sapphire guarded drives away fears, keeps from slanders, unfair courts, perfidy and treachery. On the east of Sapphire traditionally considered petrifying drink of gods, bringing them immortality, and sapphire bowls improved, sometimes very considerably, any content, poured in in them. Stone is the talisman of prisoners, helps them to be freed and inclines the authority on their side. It in general is instrumental in "opening" of any doors, including doors of vital advancement, that opens a people a way, offering a lot of variants of the personal development. Sapphire softens anger of gods and is one of sweet one by them bringing. Stone activates spirituality of people, gives inspiration and intensifies the world perception. It links a people through socializing with angelic essences with all of space, with to the universe and results in God. However, quite unavailing egoists and dark personalities of stone and will not begin to work on such usurper. Sapphire of deep dark blue color - "Royal Sapphire" grants the possessor loyalty and modesty (if that is clean the soul), helps an of prayer concentration. Therefore he is sometimes named the "stone of nuns", which cools passions and keeps a chastity. Sapphire of dark blue color is character of the soul, directed in eternity. Dark blue Sapphire - stone loyalty, chastity and modesty (as well as other dark blue stone). Protects the proprietor from envy, cures from a melancholy, cheers a heart, happy senses, attracts the favour of fate and liking of circumferential. Winnows cold, passionless rest from the blue of Sapphires - both deep, dark to the blackness or light, as transparent March ice under sticker northern sky of early spring. In antiquity he was considered the stone of contemplation, reflections, by character of celestial dome. That is why he was especially valued by the servants of religion. The special magic energy power force is possessed by starred asterisk Sapphires from 3 and 6 intersecting lines, reminding a snowflake, symbolizing magic numbers 3 and 6 (they are cut cabochon). In antiquity dark blue Sapphire was considered the stone of navigators, as trusted that he helped to avoid a ship-wreck and cause necessary wind. Sapphire is a talisman of falling in love and newlyweds, brings a luck in love and keeps from slander. Talisman of wise - excites thirst to cognitions, strengthens memory, strengthens prudence and reasonableness.